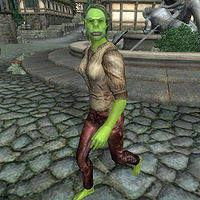 Homraz gra Morgrump is an Orc thief who, while listed in the Construction Set, never appears in the actual game. She is set up to appear in Chorrol and seems to have been intended to play a role in the Dark Brotherhood quest The Assassinated Man as she shares the same script as the enforcer Hides-His-Heart. Homraz would have had a pretty simple schedule, she would have slept from midnight to 6am. Once awake, she would spend the next six hours wandering around, stopping for a two-hour meal at midday. The next four hours would have been spent wandering around again, before having another two-hour meal at 6pm. Afterwards, she would continue wandering around until heading to bed again at midnight. All this would have taken place at her undesignated "editor location". She would have worn a coarse linen shirt and laced leather pants. She also would have carried a small amount of gold. When speaking to her for the first time, she'll say: "I'm busy, here, ok? You mind giving us some privacy?" When asked about Chorrol she will reply: "I've never been here before. And I won't be back, unless the boss wants me here." If you attempt to speak with her again she will dismiss you: "I got stuff to do. Don't bother me." The prefix "gra" in her last name lacks the usual hyphen. She shares a script with Hides-His-Heart, as well as a similarly cut character, Wallace. This page was last modified on 17 August 2018, at 13:29.